The donation of five lionesses from the Phinda Private Game Reserve in KwaZulu-Natal (KZN), South Africa, to the Akagera National Park in Rwanda in June, is the latest in a growing list of initiatives adopted by the wildlife tourism operator, andBeyond, to bolster wildlife conservation on the African continent. 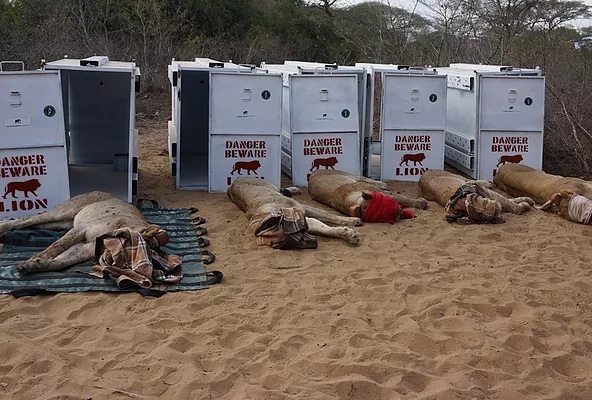 The lionesses, along with two male lions donated by the provincial wildlife authority Ezemvelo KZN Wildlife, were translocated to Akagera in an effort to reverse extinction in Rwanda. Their journey began in late June, when they were tranquilised, crated and driven to Johannesburg to be flown by charter to Kigali. On arrival they were transported by road to Akagera and placed in a large fenced-off enclosure to acclimatise for a 14-day period before release into the wild. Throughout, they were accompanied and monitored by a veterinary team. Before departure, the animals were fitted with satellite collars with a two-year lifespan. These will enable Akagera personnel to monitor the movements of the lions as they settle in, reducing the risk of them breaking out of the park into neighbouring community areas. Akagera’s management team has been running sensitisation programmes within these communities, driving home the significance of lions in the local landscape. Phinda is one of 33 lodges and camps that andBeyond owns and operates in Africa. The 23 000ha (56 800 acre) reserve was once degraded farmland, that has been re-established as viable Big Five wilderness. The introduction of lions to this reserve in 1992 represented a historical extension of their range in South Africa. Since then, over 200 lions have been born at Phinda. 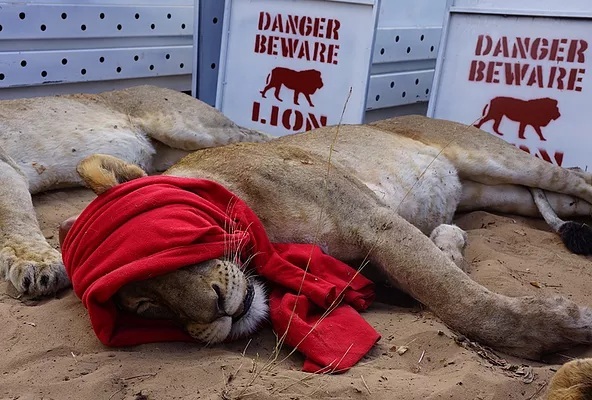 With their genetic diversity, a number have been relocated to aid the establishment of lion populations in private game reserves in five other South African provinces, as well as Mozambique. This game sanctuary has become the seat of much animal research. Between 2002 and 2012, a leopard monitoring programme at Phinda saw 72 leopards radio-collared and tracked. Findings led to a decrease in leopard hunting. A groundbreaking quarantine programme has further made the reserve a major source of tuberculosis-free buffalo, with over 1 000 moved to other reserves. Studies into elephant contraception are sustaining Phinda’s elephant herds, without the need for culling. Phinda was also the site of an Ezemvelo KZN Wildlife black rhino expansion project – today the reserve boasts healthy populations of both black and white rhinos. The five lionesses from the Phinda Private Game Reserve in KwaZulu-Natal (KZN), South Africa. Their journey began when they were tranquilised, crated and driven to Johannesburg to be flown by charter to Kigali. Before departure, the animals were fitted with satellite collars with a two-year lifespan. These will enable Akagera personnel to monitor the movements of the lions as they settle in, reducing the risk of them breaking out of the park into neighbouring community areas. On the subject of the much-beleaguered rhino, poaching of this animal is at an all-time high. andBeyond have teamed up with another conservation company, Great Plains Conservation, to move 100 of these animals to the relative safety of Botswana, which has an effective ‘no tolerance’ policy to the problem. The initiative is part of the Rhinos without Borders project. On the island Mnemba near Zanzibar, where andBeyond operates another exclusive lodge, the company has undertaken a number of marine conservation efforts, including negotiating the formation of the Mnemba Island Marine Conservation Area, which protects the waters around the island. The location is one of Tanzania’s rare nesting sites for endangered green turtles, and the lodge has contributed to an understanding of their survival through diligent record keeping since 1998. Some 60 000 turtles have been born on the island in that time. The lodge has also hosted researchers studying the coconut crab, the world’s largest land crab, but perhaps the least known. A decade back, five of the continent’s rarest antelope, the Ader duiker, were introduced to Mnemba and have since tripled in number. The Wildlife Conservation Society (WCS) estimates there are only 300 – 600 left in the wild. Additionally, suni antelope from Zanzibar were brought in, and in the absence of predators are breeding twice, rather than once, a year on Mnemba. In mainland Tanzania at Grumeti Serengeti Tented Camp, a select group of lion and hyena are fitted with GPS collars so that their symbiotic relationship can be studied, and at Ngala Private Game Reserve in the Kruger National Park, the Southern African Wildlife College has been established, providing training in natural resource management and conservation to underprivileged youths. Through these, and many more examples, andBeyond is demonstrating that wildlife tourism operators can make a significant contribution to the sustainability of the environments they operate in.